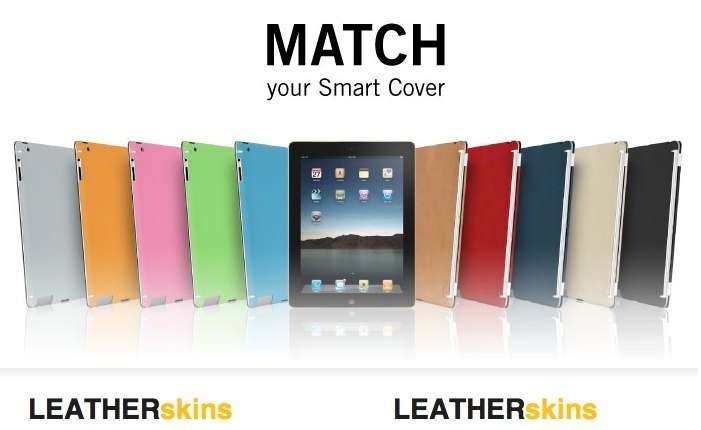 ZAGG’s has just released LEATHERskins – a set of soft, think skins to apply to the back of the iPad 2 and perfectly match the colors of the iPad 2 Smart Cover. There is a set of Leatherskins to match the colors of the polyurethane iPad 2 smart covers, and another set to match the colors of the leather iPad 2 smart covers. These skins are actually made of genuine leather, but they are applied like a film. They’re just 3mm thick and weigh only 1-2 ounces. I have to say these look very good to me. I’ll be trying one out soon, to match my leather navy iPad 2 smart cover. These look like they could rival my current favorite setup for the iPad 2, with smart cover and a Gelaskin on the back. The Leatherskins are priced at $49.99 or $79.98 with invisbleSHIELD screen coverage. For more details or to place an order check out the Leatherskins web page.